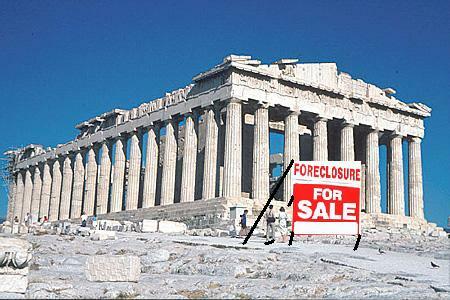 Why selling the entire country is the best thing that could ever happen to the Greek people. The good news for Greece is the ECB, along with the great leader and visionary Angela Merkel, have granted Greece the exclusive one-time offer and privilege of being able to sell their own country. If you didn’t know countries can be for sale, now you do. As part of the minor compromise of the bailout, the Greek government has agreed to sell off 50 billion euros of assets that will kick-start the process. 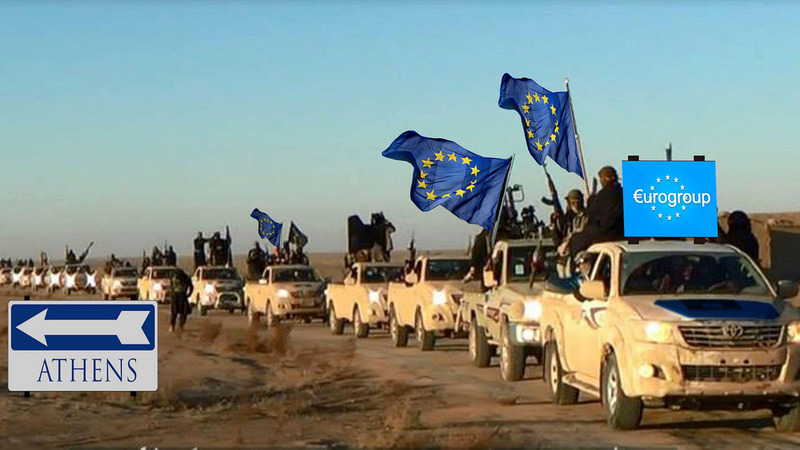 The money from the sale has to be placed in an account that is controlled by the ECB and Merkel, because we all know it’s safer in their hands. It all makes total sense, as they really need the bailout money to pay back the loans and interest from previous loans. It’s like the circle of life, but with money, as what they are given just boomerangs its way back to the coffers of those benevolent do-gooders who are willing to lend it. Not since Belgium’s King Leopold sold Congo have his descendants been able to buy back another country. At least this one’s closer to home. It’s about time we got rid of pesky governments and annoying things like human rights and kindness. In selling Greece we have the potential, for the first time ever, to franchise an entire country. How exciting. Slavery was always underrated and now the economic units of Greece, within the framework of a franchise model, can be put to work as modern-day slaves. Isn’t it romantic? This time we don’t need whips and chains; we can just starve the ones who defiantly don’t comply, as you know there are always a few who make a fuss for fuss’s sake. This whole “selling a country” idea is just the beginning, as the truth is anything and everything can be sold. 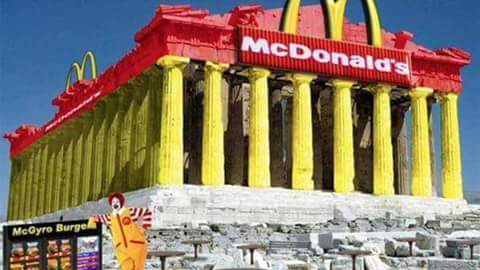 I personally will suggest to the Greeks’ new CEO that they start looking at the ROI of their economic units and think more laterally on what can potentially be lucrative revenue streams. Let’s face it, for far too long oxygen has been a luxury people have arrogantly taken for granted. The truth is, like a Big Mac, oxygen is a great investment for everyone, but all investments must be paid for, and for the mooching class of Greece drawing breath isn’t something they can expect their new owners to be subsidising. Fair is fair. Taxing the amount of oxygen each economic unit consumes creates a constant revenue stream and great ROI. Also, people can create savings, as they always have the option of learning to hold their breath for a longer time. It’s win/win. Another commodity that’s equally taken for granted are “feelings.” People walk around all day having feelings: happy, sad, angry or depressed. The new owners of Greece, Inc. have ongoing costs of managing those feelings and it’s unfair they are burdened with that kind of management process without being effectively remunerated. So listen, scroungers of Greece, free lunches are over! It makes sense that negative feelings are taxed more heavily. Greece, lnc. doesn’t want all these sad sacks moping around feeling sorry for themselves just because they and their children are hungry to the point of starving. Come on, guys. Turn that frown upside down. I am serious, you better do that so those feelings don’t get put in the higher tax bracket. Taxing feelings is such an innovative and ground-breaking idea, as it will reward those who look on the bright side of their modern servitude and punish those “glass half empty” types. Like with air, people can make massive savings by learning to just suppress and deny any negative feelings. They can be a team player and push that existential despair and bleakness way, way down. You’ll find there is plenty of room in the dark abyss that once held your hopes and dreams before they were extinguished. 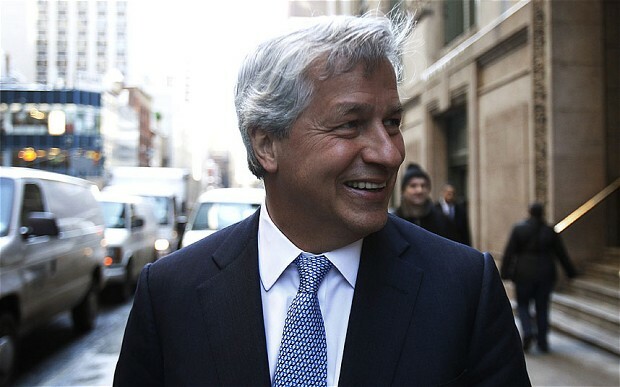 Jamie Dimon: potentially one of Greece’s new owners. I am so excited Greece is for sale, as we all know privatisation is the most effective use of resources and the most lucrative ROI for the people who matter most, being those bravely willing to buy these assets at pennies on the dollar, whilst the seller has a gun pointed to their head. Taking such risks should rightfully be compensated and should continue to be so until the earth becomes inhabitable in the next 50 years. The Greek people should count themselves lucky; being owned in mind, body and spirit is truly liberating, as you don’t have any problems or responsibilities. All you have to do is kick back, relax and do the mandatory 12 hours a day, 7 days a week hard labour. How could you not want that? So, Greece, I salute you and wish you all best. A new dawn is born and the future is looking extremely bright for Greece’s new owner. Let’s be happy for them, clap when instructed and enjoy the few crumbs they lovingly sweep off the table.